A Canadian woman whose husband has been jailed without charges in Egypt for almost a year participated in a rally Saturday, urging Ottawa "to do the right thing." Sara Attia's husband Khaled Al-Qazzaz is a permanent Canadian resident who served as secretary of foreign affairs for ousted Egyptian president Mohammed Morsi. July 3rd will mark one year since Al-Qazzaz was arrested. He has been held in Cairo's Tora prison without charges. "Just to think of what's he's going through… he spends 23 hours a day in a cell with no windows," Attia told CTV Toronto on Saturday. 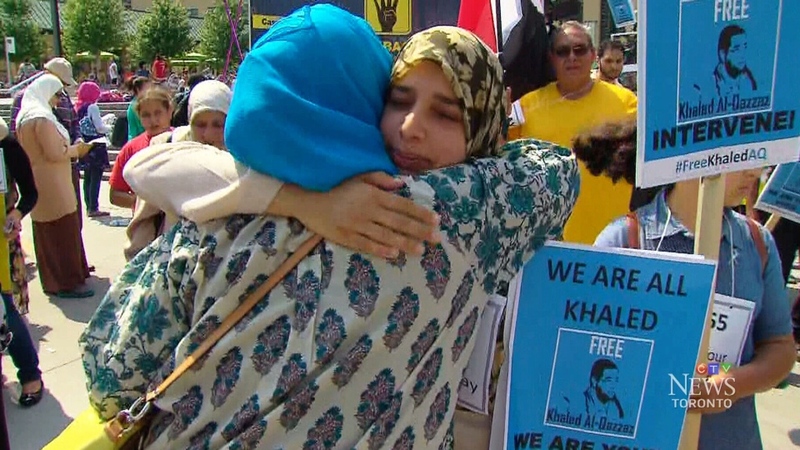 Attia was born and raised in Mississauga, Ont., where a Free Khaled Al-Qazzaz protest was held Saturday afternoon near Celebration Square, at Mississauga city hall. "We are calling on a minimum of 365 supporters to come out," a message on a Facebook page for the rally said. "Each person will represent one day of solitary confinement." Attia met Al-Qazzaz while studying at the University of Toronto. The two were living in Egypt, along with their four young children, where they were helping with the construction of a school. Attia and her children have since returned to Canada in the hopes of persuading Ottawa to push for Al-Qazzaz's release. "Canada needs to call on Egypt to do the right thing," Attia said. On Saturday, the department of foreign affairs released a statement about Al-Qazzaz. "We are aware of the detention of Mr. Al-Qazzaz and Canadian officials remain in contact with his family. 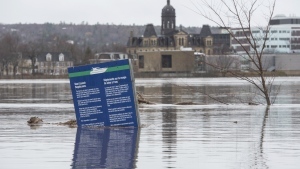 To protect the private and personal information of the individual concern, further details on this case cannot be released." Attia's family and their supporters, however, say the government needs to take a stronger stance. "He's one of thousands in jail without any charges," a protester told told CTV Toronto. On Friday, an op-ed written by Al-Qazzaz was published in The New York Times. "In a few days' time, I will compete 365 days of imprisonment, more than half spent in solitary confinement and under severe limitations in the maximum-security Scorpion wing of Tora prison in Cairo," he writes in the op-ed titled "Why is the world silent?" "I have spent the past year thinking about what drove me to where I am today. I have also been thinking about an explanation for why politicians, human rights activists and the media have largely been silent about my case." Attia told CTV Toronto that, last week, an Egyptian court ordered her husband be held in prison without charges for another 45 days. He will spend his 35th birthday in prison. Saturday's protest comes less than a week after Canadian journalist Mohamed Fahmy was sentenced by an Egyptian court to seven years in prison on terrorism-related charges. The Al-Jazeera reporter and his co-workers – Australian Peter Greste and Egyptian Baher Mohamed – were arrested on Dec. 29. They were accused of providing a platform for the Muslim Brotherhood group of ousted president Mohammed Morsi. The Egyptian government has branded the group a terrorist organization.